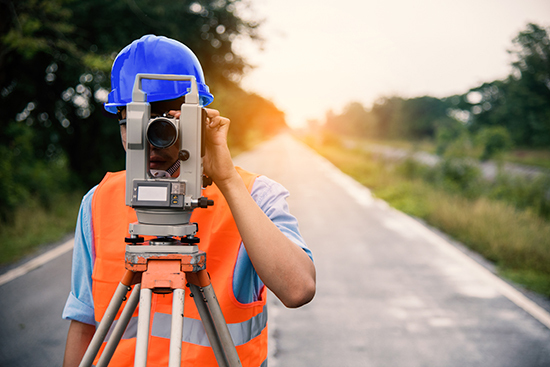 The Blinn College District’s Land Surveying Program is designed to meet the community’s growing demand for entry-level land surveyors. Land surveyors mark and document the location of legal property lines and establish official land and water boundaries for deeds, leases, and other legal documents. When taking measurements in the field, surveyors use the Global Positioning System (GPS) to locate reference points with a high degree of precision. Surveyors also use Geographic Information Systems (GIS) to present spatial information visually as maps, reports, and charts. This five-week program consists of two courses: Introduction to Surveying and Field Engineering I. Those who successfully complete the program will earn the Occupational Safety and Health Administration 10-Hour Certification, the Texas Department of Transportation Flagger and Traffic Control Supervisor Certifications, and the National Center for Construction Education and Research Sight Layout Certification. In Introduction to Surveying, students receive an overview of the surveying profession and review the mathematics used in surveying. The course includes an introduction to basic surveying equipment with an emphasis on measurements, and provides instruction on surveying procedures and using calculation to determine precision. Field Engineering I covers surveying equipment, sketches, proper field note taking, methods of staking, layout of a building site, and establishing horizontal and vertical controls.